A stunning synthesis of virtuosity and energy, The Outside Track’s marriage of Canadian, Scottish and Irish music and song has been rapturously received around the world. 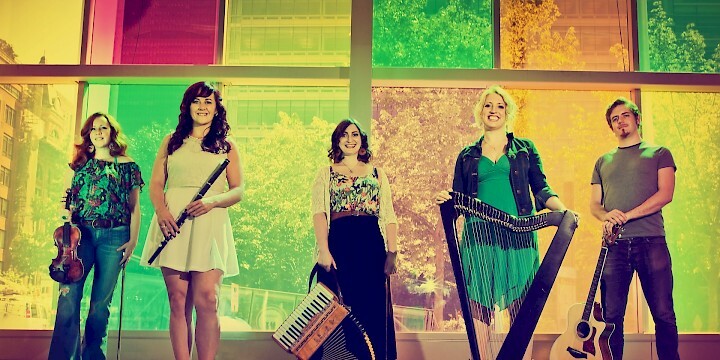 Hailing from Scotland, Ireland, Cape Breton and Vancouver, its five members are united by a love of traditional music and a commitment to creating new music on its foundation. Using fiddle, accordion, harp, guitar, flute, step-dance and vocals these five virtuosos blend boundless energy with unmistakable joie de vivre. Each player within The Outside Track is a master of their chosen instrument with the band stacking up an impressive amount of international awards. This amount of talent alone would be enough to recommend the band but in this case the end result is so much greater than the sum of the parts. 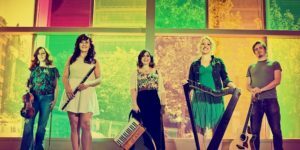 The line up comprises Norah Rendell (Canadian Traditional Singer of the Year nominee), Mairi Rankin (Beolach), Ailie Robertson (Live Ireland Winner, BBC Young Trad Finalist), Fiona Black (BBC Fame Academy Winner), and Cillian O’Dalaigh.